London South Bank University’s (LSBU) School of Architecture and the Built Environment and School of Law and Social Sciences have played a vital role in Southwark Council’s bid to win hundreds of thousands of pounds in funding from Historic England to create an exciting Heritage Action Zone (HAZ) that will revitalise the heart of South East London’s Walworth district. The successful bid was put together by Southwark Council, in partnership with LSBU and The Walworth Society. Historic England announced that the bid had been selected by the reviewing panel on Friday 8 December. The excellent industry connections afforded by LSBU’s School of Architecture and the Built Environment were credited by the panel as one of the key factors in Southwark’s success in winning this bid. “LSBU welcomes the opportunity to be part of this exciting Historic England Initiative to restore and revitalise Walworth - a previously neglected area of South East London - close to the dynamic and fast-changing hub at Elephant and Castle. It is great to hear the news that Walworth’s heritage will finally receive some much-needed attention. “LSBU worked hard, together with Southwark Council and The Walworth Society, to put together an exciting but deliverable programme of heritage restoration for Walworth that will build on its relatively new Conservation Area Status and help to remove some of its historic buildings from the ‘Heritage at risk’ register. Jeremy Leach, Chair of The Walworth Society said: “The Walworth Society is delighted that our neighbourhood has been chosen as one of the Heritage Action Zones singled out for restoration. 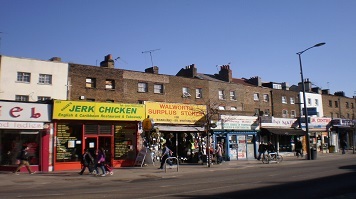 The vision of Southwark Council and its partners, including LSBU, community groups, local historians and archaeologists, as well as the principal developers working in the area, is to rediscover, celebrate and enjoy Walworth as a historic urban village, a civic town, and as a vibrant place of character where people want to live, work and explore. The project to redevelop and revitalise Walworth follows on from previously successful heritage-led schemes in the borough, including Bankside, Bermondsey and Peckham. Read more about this Historic England initiative.